I’ve always been fascinated by the ways that so many cultures celebrate a holiday in midwinter, from ancient Roman Saturnalia to Jewish Hanukkah to the Christian assimilation of pagan traditions around the winter solstice. Not to mention the somewhat arbitrary timing of the “New” Year. For me, the common thread is the return of light. Awareness of the seasons, and the moment of tipping toward spring and renewal. This is part of our human experience, no matter how we choose to interpret it. I dwell in a body that is finely-tuned to seasons and daylight. Four to six percent of North Americans live with Seasonal Affective Disorder, which is more prevalent the further north you go. It’s been 17 years since my official diagnosis. Every winter is different, and I have learned a lot about coping. I no longer suffer to the extent that I once did although I still have some rough days and getting out of bed on dark mornings is a struggle. So the winter solstice on December 21 is a big deal to me. To create a personal observance, I researched different rituals and traditions. I settled on twelve candles in a circle on a white cloth with evergreen boughs. 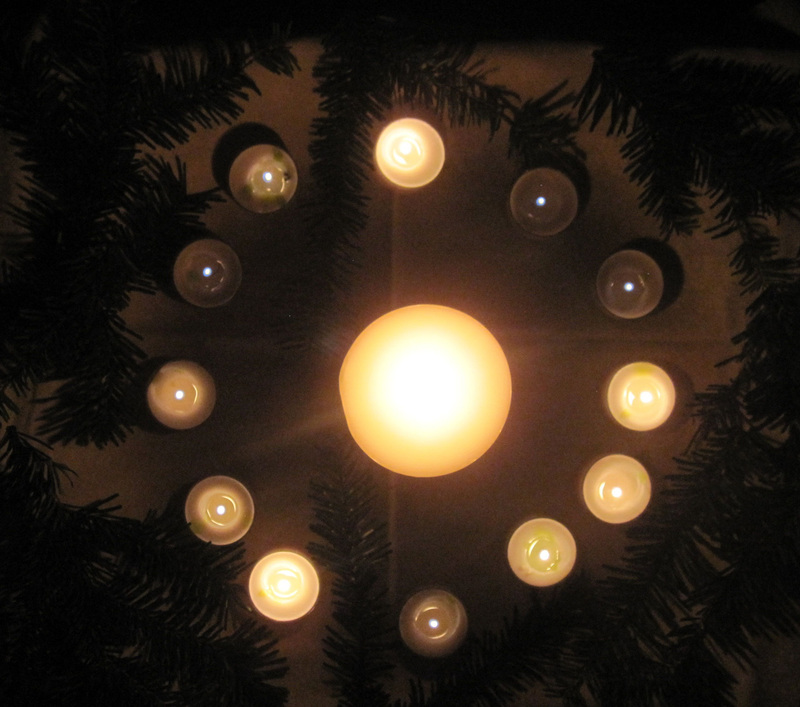 In the center is a larger candle, the sun candle. In the evening, I open the blinds so I can see outside, then turn off all the lights in the house. I sit in darkness until I am ready to begin. It is the longest night of the year. Then I kindle a flame with a match and light the sun candle in the center. With a small taper, I light each of the twelve monthly candles, acknowledging the circle of seasons and return of the light. Once the candles are all lit, I close my eyes and begin the buddhist practice of metta, or loving-kindness. From my place, I imagine a line spiraling out from my heart. It heads north a couple miles and touches friends in the next town, following the geography to the west and south and east, connecting my all my special people. The spiral expands and widens, reaching out into the Pacific Ocean and circling up through New Mexico to friends in Montana, and even beyond. The spiral winds out across continents, enveloping people I don’t know. There is a special attention to places that are torn by war and plague and natural disaster, to those who are caught in suffering not of their own making. The spiral runs through Africa, up into Russia, across Asia and down into South America. The entire planet is held in my spiral of connection. May all beings be free from worry. May all beings be well. May all beings be safe and at ease. May all beings be at peace. My ribcage expands with each breath, leaking light and love. There is nothing between me and my goodwill toward everything that is. I sit that way for awhile, then open my eyes. The candles flicker, and their light is warm. Slowly I blow out the small candles in the circle, but leave the sun candle burning. I will light it throughout the year to remember the dark and light contained in the seasons. I ask myself what I want to grow in the new year. This year I planted a hyacinth bulb in a vase of water. It should bloom in about six weeks, the midpoint between the winter solstice and the spring equinox. That is not the only thing I will grow, and I’m thinking of the words I want to carry into 2015. The theme, the touchstone, the seed that sprouts in the dark and grows into the light. Anchored in my observance of the solstice, I move ahead with Christmas preparations with family. We share favorite things and memories, and it is a sweet time. The part of me that is still a child loves it as much as ever. And then it’s over, and the New Year looms. And the proportion of daylight increases, minute by minute. That is worth celebrating! Beautiful, Deb. I ,too, look very much forward to having a little more light every day. Talk to you soon!